It's already too late for these doomed cars, but there are more to come in the next future. Maybe MBTA could use these on the Ashmont-Mattapan Line. I see that the T bused the Mattapan line this morning in the face of a Boston forecast for two to four inches of snow. I know that the line lacks real plows, but that's not even enough to cover the rails. Are the PCCs really that allergic to snow these days? In their heyday across the system it would take an awful lot more snow than that before they needed assistance from the Type III plows. Am I wrong, or does one of those have the light rail equivalent of a dome car for a center section? It's not really a "Dome car", it's called "Panoramic Section". There were just glass windows added in the roof section and better upholstered seats. Jeez, I remember seeing these center-sections being delivered by train, as it was yesterday, and now they're on their way to the scrapyard. The line was also represented for eons in the Legislature by convicted ex-Speaker Tom Finneran, whose political affinities were way more in line with the folks who made up Valley Rd. 's 45 daily boardings than the diversity of Mattapan Sq. He was as anti-transit cro-magnon as they came, and instrumental as Ways and Means Chair at saddling the T with the Big Dig's debt when Forward Funding was cooked up...but don't you dare inconvenience the fine citizens of Capen St. who faithfully pulled the lever for him for 12 terms! That has to be duly noted when discussing public opinion from the late-70's to mid-aughts on the line's future, the bustitution controversies, and the various studies. The very smallest of the stops had the very biggest obstructionist in the state in their corner. That is not the case anymore. In fact, redistricting has changed the calculus a lot. 12th Suffolk used to be this gerrymandered (by his own hand) monstrosity that hugged the leafiest parts of the Neponset shores and pretty much only took the immediate Mattapan Sq. area as its population anchor. Now it's radically different with Milton + Central Ave. now shifted to 7th Norfolk and 12th Suffolk surging further into Dorchester to absorb Ashmont and the neighborhood around Morton St. Much more transit-dependent constituency, and in 7th Norfolk Milton + Central Ave. are the only 2 rapid transit stops in the whole district. Plus...you know...neither of the current reps there are (yet, at least) power-drunk convicted autocrats like the last guy. 3234 is on the move. 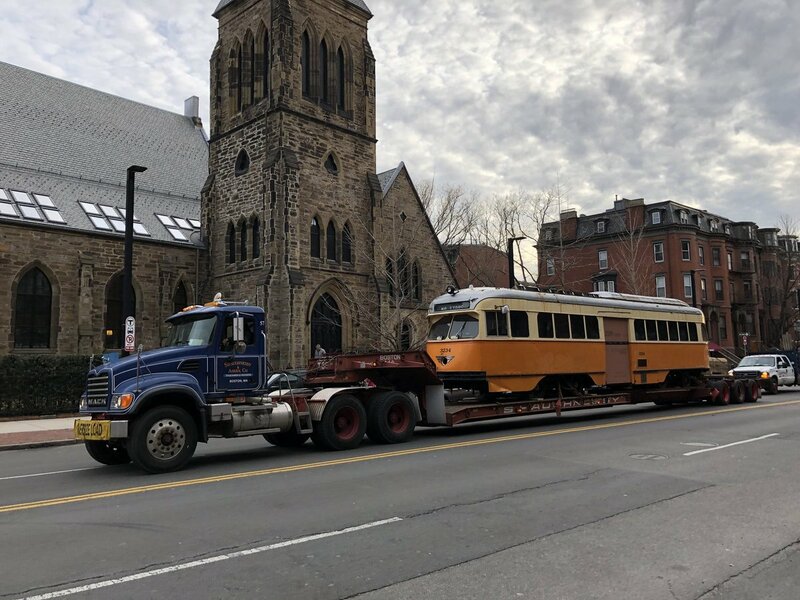 I see that the T is running buses on the line again "until further notice due to required vehicle maintenance related to the winter weather". I love the PCCs as historical flashbacks but I'm wondering how long they are sustainable without complete electromechanical rebuilds that may or may not be economically practical. Everett should fabricate some frames and new carbodies and make a few real plows using the trucks and propulsion equipment from those Type 7s that are bashed up and aren't getting overhauled (or maybe use the guts of an 01200 before all that stuff gets junked?). Those lead sleds are near useless... and can a PCC even shove one of them? The 8 wrecked Kinkis that won't be rebuilt have already been combed over for parts donations for the rebuild program, and don't have matching rebuildable A and B ends to be re-mated with like the 4 wrecks that are being rebuilt. There isn't enough to sort through there to Frankenstein up a functioning work car. The T's chance to get some new powered work vehicles to replace the 3 OOS Boeings and fill any new needs comes with the +30 option on the Type 9 contract. If they expand out the new fleet to 54 cars (i.e. the above-and-beyond quantity that would let them institute regular 3-car trains) they'll be able to sideline a few Kinki rebuilds for internal conversion into work cars that'll last a lot longer than the Boeings did in that role. PCC's have enough kick to push snow just fine. It's the undercarriage layout and propensity for snow getting sucked into the motors that's the problem. Unlike the Orange Line cars where simple hairnets can give the blowers a modicum of protection from ice intake and unlike the Kinkis which seem to be largely impervious to it, however the PCC's are laid out underneath leaves them unusually vulnerable to slurping up snow from below the railhead. That's why they bring in the Snowzilla melters; it's not enough to just plow the ROW down to the railhead, but they actually have to remove all snow straight down to the ties and ballast between the rails and in a car's radius all-around. More plows wouldn't address the exact propulsion issue that's sidelining the cars right now. The PCC rebuild program is, as part of its top-priority propulsion rebuild, going to install new motor assemblies with real snow protection shielding to lick this longstanding problem for good. Not going to help this winter, but the frequency and duration of these bustitutions should finally be reined in once the rebuilds are done. In the meantime, a second Snowzilla for the Red work roster would be nice because Red has its own vulnerabilities. And maybe they should think about buying a genset rapid transit work loco to augment the seldom-used Plymouth 50-tonner at Cabot. That can serve as a powered plow when hi-rail or push plow isn't enough, and would be more useful for year-round work than trying to rig up another specialty traction plow car. Why would snow be sucked into the motors from the railbed, they have forced ventilation cooling. Or it is another case of not putting the pan covers back on the motor controllers, as was common when the PCCs ran on the Green line. F-line to Dudley via Park wrote: PCC's have enough kick to push snow just fine. It's the undercarriage layout and propensity for snow getting sucked into the motors that's the problem. Unlike the Orange Line cars where simple hairnets can give the blowers a modicum of protection from ice intake and unlike the Kinkis which seem to be largely impervious to it, however the PCC's are laid out underneath leaves them unusually vulnerable to slurping up snow from below the railhead. Is this a function of one of their past rebuilds, or poor maintenance? As I'm sure you know, PCCs successfully ran in winter weather around the country for decades, and when PCCs comprised the entire MBTA streetcar fleet they were as tolerant of snow as any surface vehicles. They generally had no problems unless the snow got so deep -- over a foot, say -- that they didn't have the horsepower to plow through it. Normal snowstorms of a few inches weren't an issue for the PCCs in their heyday, as in the case of the one in the photo below that I took on a nasty day in February 1969 at Chestnut Hill on the Riverside line.